When creating a custom logo ribbon for your business or event, simplicity of design is key to an effective message. A good graphic designer will provide you with high-resolution art files that will work stacked, vertically and horizontally. 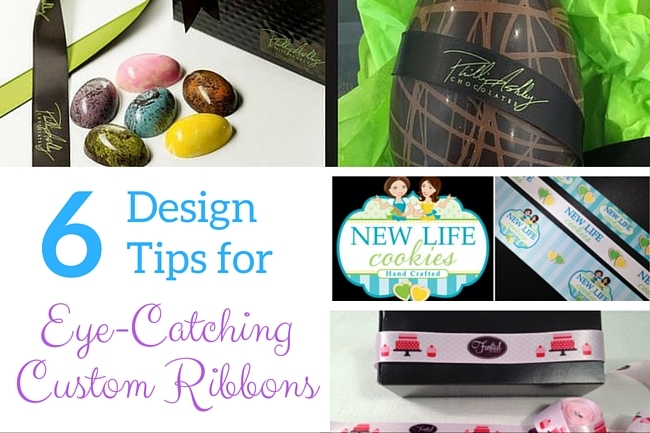 Taking the design process itself into consideration, here are some useful tips that will make your ribbon design stand out among the rest! It is important to consider the medium when deciding on a logo that will give your packaging some flair. Ribbon is a horizontal medium. If you have a logo with multiple elements, all elements do not need to be included to communicate your brand. Think of Nike, you only have to see the “swoosh” icon in order to understand the brand. Simple is always best! Illustration software is optimal when creating a logo. Vector art enables any design team to separate the design elements. An investment is high-resolution art files will save you money in the long run. Whether you are looking to purchase ribbon, banners, or business cards the same files can be used in every application. Be flexible and open to possibilities! We are often asked to create ribbons with the same logo in a variety of widths. A wider ribbon can include many more design elements than a narrow ribbon. Here is an example of how we worked with the same logo using design elements rather than the entire logo. An example of how we adjusted a brand logo for different ribbon widths. 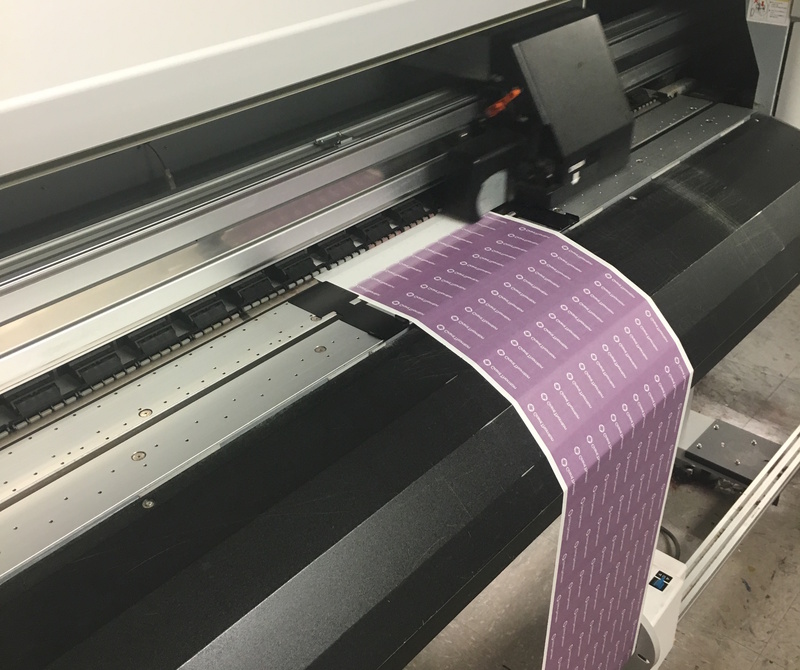 A vertical, detailed logo printed on a ribbon as narrow as 1/2” or smaller creates greater design challenges and is more costly. Keep it as simple as possible. It is important to take into consideration that having unnecessary items such as all of your contact details included in the design, takes away from the overall presentation of your product. As long as the primary information is visible, the customers will find you! We use dye sublimation technology in our printing process. This process uses dyes that are transferred into the fabric at a temperature greater than 400 degrees Fahrenheit. This guarantees that our ribbon will never fade or peel. 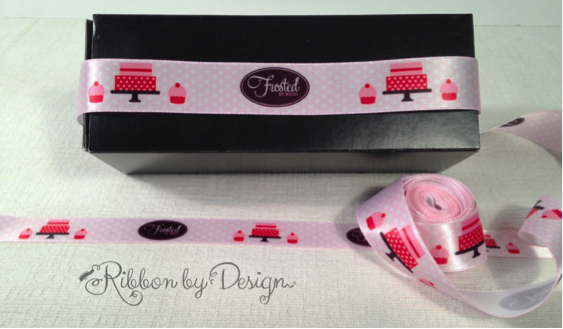 Our ribbons are fully washable and can be ironed if they become wrinkled without disturbing the design. Our machine is printing dyes on a special paper, which will be applied to a ribbon. Don’t have a logo? Worry not! We have created some beautiful ribbons with carefully selected fonts along with a library of simple design elements. From whimsical and cute, to classic and sophisticated, we have it all! We offer one hour of free design consulting service to work with us in creating a custom ribbon design for your business or for your specific event.